8 million poinsettias will be sold in the UK this year, and between 105 and 110 million poinsettias will be sold in Europe this year, of which 32 million will be sold in Germany. Plenty of reason for Stars for Europe, the marketing initiative of European poinsettia breeders Dümmen Orange, Selecta One, Beekenkamp and Syngenta, supported by MNP Flowers, to support the UK Poinsettia campaign. In the US, National Poinsettia Day honors Joel Roberts Poinsett. Poinsett -- a botanist, physician, and the first U.S. Ambassador to Mexico -- spotted the brilliant red blooms on a trip south of the border in 1825. Enamored with their beauty, he shipped some back to his hothouse in Greenville, South Carolina. It was there that he began propagating and sending the plants to friends and botanical gardens. Bartram’s Garden received one of his plants and introduced it into commercial cultivation. Read more about the day's backstory here. New Jersey Secretary of Agriculture Douglas H. Fisher celebrated this special day by visiting Lucas Greenhouses in Gloucester County. 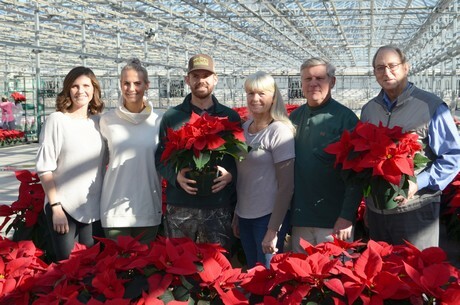 Lucas Greenhouses is a family owned and operated horticultural grower, producing more than 30 different varieties of poinsettias among its 1.7 million square feet of indoor growing space. 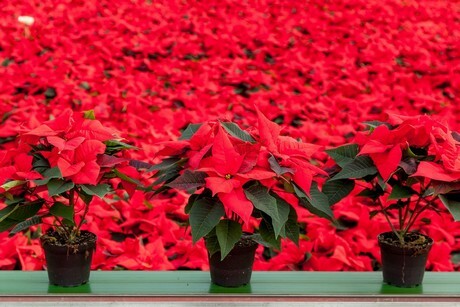 The operation offers several sizes of poinsettias ranging from 4.5-inch pots all the way up to 14-inch pots in a variety of colors including traditional reds, whites, and pinks, along with many novelty colors like red glitter. Lucas Greenhouses has been growing ornamental holiday crops, like poinsettias, since 1979 in southern New Jersey.